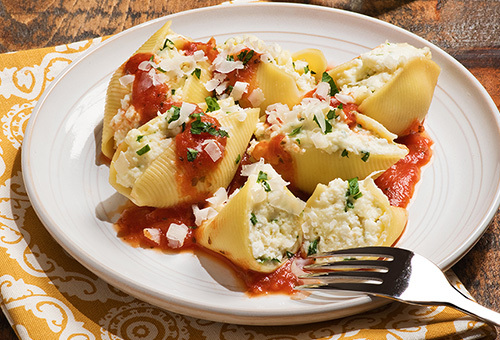 This traditional stuffed shells recipe will become a family favorite. 2. Prepare pasta according to package directions; drain. 3. Meanwhile, in medium bowl, stir together cheeses, eggs, parsley, salt, pepper and nutmeg. 4. In 13 x 9 x 2-inch baking dish, spread 1/2 cup pasta sauce. 5. Fill each cooked shell with about 1-1/2 level tablespoons cheese mixture; layer one-half filled shells in-prepared dish. 6. Spread one-half remaining sauce over shells; layer remaining filled shells over sauce. 7. Spread remaining sauce over shells; sprinkle with additional Parmesan cheese, if desired. 8. Cover with foil; bake 35 minutes or until hot and bubbly (doubling recipe or more may require increased baking time).